Andrew Owen, Paul Anderson, and David Levinson (2012) Relative Accessibility and the Choice of Modes. (Working Paper). The factors influencing commute mode choice are a subject of ongoing research and policy. Existing literature explores a wide range of factors which may influence mode choice; many of these focus on demographic factors as well as user preferences and perception, thereby highlighting the unique characteristics of each mode. This analysis hypothesizes that mode share, the aggregate expression of individuals’ mode choices, is determined in large part by more fundamental properties of transportation systems. Accessibility, which measures the ease of reaching destinations, is used as a tool for comparing modes which focuses on their properties as abstract transportation systems. It explores the potential to predict the relative commute shares of non-auto and auto modes from the relative accessibility provided by each. 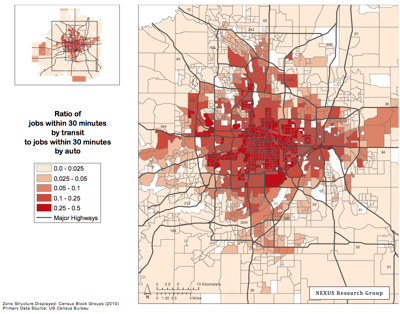 Using public data sources and methods selected for their simplicity and ease of interpretation, a model is estimated which accounts for 41% of the variation in commute mode share at the block group level in the Minneapolis–Saint Paul, MN metropolitan area.